I, prepared prawns and pork chops, the night before. 1) Remove prawns’ head. Devien the prawns using a small knife to make a deep slit down at the middle part of its back. Remove and discard the vein. 2) Clean the prawns, and rinse with water added with drops of white vinegar. Put the prawns in a large bowl. Add salt, and season well. 3) Spoon some minced garlic and stuff into each prawn, lightly press the stuffing. 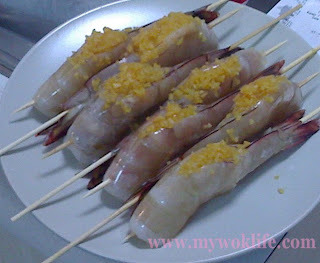 4) Skewer each stuffed prawn with bamboo skewer, and place nicely in the A4 aluminium tray. Sprinkle pepper, and ready for BBQ. 1) Get the packet chunk tenderloin pork from the supermarket, slice into 5 – 6 slices of 1cm thick each packet. 2) Place pork chops in a large bowl, season well with light soy sauce, oyster sauce, sesame oil and LEA & PERRINS Worcestershire Sauce. Add in grounded black pepper, and mix well. 3) Place the pork chop nicely in a A4 aluminium tray. 4) Drizzle the minced garlic on top, and ready for BBQ. To season the meat, use cling wrap to cover the meat and keep it in the refrigerator, to marinate for 1 – 3 hours. 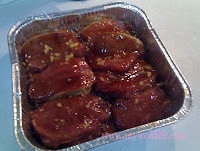 As for the pork chops that I marinated for this BBQ, the chops were salty as I added 4 tablespoon of soy sauce and marinated overnight. So, to marinate overnight, I recommend using only 2 tablespoon of soy sauce for such amount of chops. I can’t really tell you how fast I could prepare for 30 person shares, it took me 2 hours long to complete the preparations. So, I guess it should be pretty fast to make only 6 servings huh? To save a little bit of your time and effort to peel and chop all 10 garlic cloves. Purchase the ready-chopped garlic off the shelf from supermarket (it comes in bottle). I did so. BBQ food… Yummy… but fattening! Not quite, if you do not use butter to grill it. Well, if you can’t go without butter for your chicken wings and chops, expect 100 kcal per tablespoon of butter you used. Alternatively, try brushing honey to your wings and chops, and no extras for your prawn (since it has stuffing in it) instead. It counts about 60 kcal per tablespoon. In fact, the chops here have the fullest taste which enough to fill your palate, don’t add extra calories to your body… Remember also, the pork chops count 140kcal per serving of 2 slices of 1 cm thick marinated chops), and stuffed prawns count 45kcal each, before the extras. If you wish to have these at home, no worries, cook it at home, then! 1) Place stuffed prawns in the baking dish. Drizzle olive oil or brush a layer of butter on the prawns. 2) To cook, preheat oven to 230°C, for 10 min. 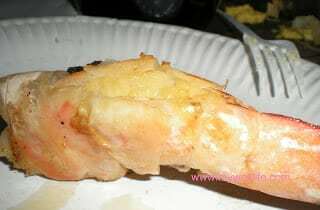 3) Bake the prawns for 8 min, or until pinked. 1) Just place chops on the grill, but remember to place the baking dish below the grill to avoid drippings. 2) Grill for 10 min, or until browned. ← List of Food on different GI/ GL and Calorie Range. A Reference to your Diet Plan.